The Sydney Metro Northwest (Surface and Viaduct Civil Works) was named both 2018 Global Best Rail Project and 2018 Project of the Year by Engineering News Record (ENR), the only project in Australia to be recognised. 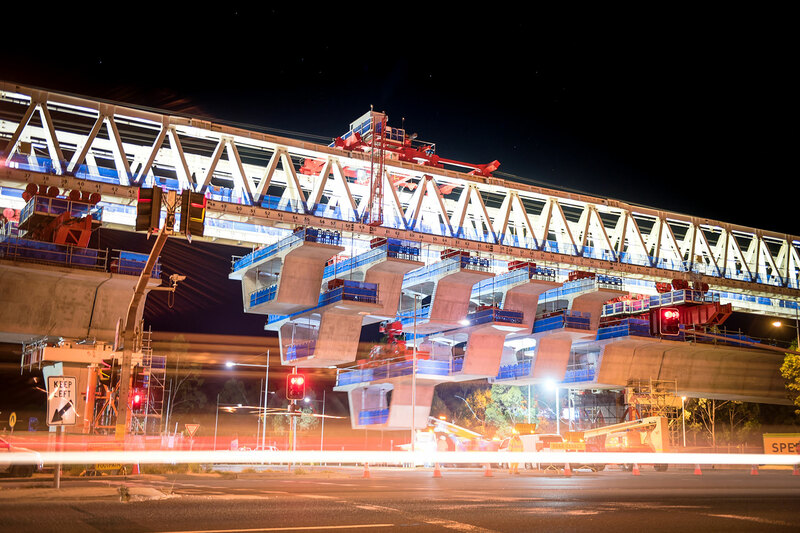 SMEC took the role of Design Lead on the project which involved building a four-kilometre elevated skytrain and a 270-metre curved, cable-stayed rail bridge over Windsor Road at Rouse Hill. John Anderson, Functional General Manager, Structures, shares what it was like to be part of the team and what SMEC learnt while leading the design of this innovative, award-winning Australian-first. Some of the world’s most iconic bridges are cable-stayed bridges. The Brooklyn Bridge is one that has appeared in countless films and it’s a classic example of a cable-stayed structure. Whilst most people have seen the Brooklyn Bridge, either in person or in the movies, very few will have seen a curved cable stayed bridge… and even fewer a curved cable stayed rail bridge. They are extremely rare, and we are proud to have been involved in the design of one in Sydney, Australia. It’s elegant, innovative, environmentally sustainable, the first of its kind in Australia and, according to Engineering News Record, the best one in the world. The curved cable stayed rail bridge in question is the Sydney Metro Northwest Skytrain Bridge and the project team responsible for its creation was made up of experts across the globe, with SMEC taking the role of design lead on the innovative, award winning project. The 270-metre bridge and its accompanying four-kilometre-long elevated skytrain was an engineering feat and SMEC pushed the boundaries on how a cable stayed rail bridge can be designed and built. The design challenges that arose throughout this project were complex and many. As with most large projects, success often comes down to how well a diverse group of people communicate and work together towards a common goal. Our team’s expertise and the level of collaboration, along with strong leadership, project management and technical oversight, cannot be overstated. The team’s collective knowledge, patience and tolerance were critical factors in the successful delivery of the project. SMEC worked closely with the contractors’ management and technical teams and made a conscious effort to pre-empt and solve technical challenges as they arose. The complete integration of the various levels of design and construction expertise ensured strategies were defined and implemented quickly. SMEC’s team in Sydney led the design work with support from our Structures team in South Africa. We worked together closely and were in constant communication which was fundamental to our success. It helped us reach intelligent solutions quickly and to further build valuable relationships which proved critical during more demanding stages of the project. Having a number of people working on the project meant that we needed a strong focus on delivery times and being responsive. Both inside and outside our organisation, we needed to prove that we could be relied on to promptly deal with problems if they occurred. We often had many short-term deadlines and we aimed to engender transparency and accountability within our team. For example, we held short open meetings every morning to discuss any outstanding and upcoming matters for the days ahead. We had a relentless focus on quality. Because of the complexity of the bridge, two engineers worked exclusively on analysis models. They could check each other’s work at regular intervals. Scrutinising all design work and drawings at regular intervals was essential as the consequences of any mistake were severe. It’s elegant, innovative, environmentally sustainable, the first of its kind in Australia and according the Engineering News Record; the best one in the world. The curved cable stayed rail bridge in question is The Sydney Metro Northwest Skytrain Bridge and the project team responsible for its creation was made up of experts across the globe, with SMEC taking the role of design lead on the innovative, award winning project. 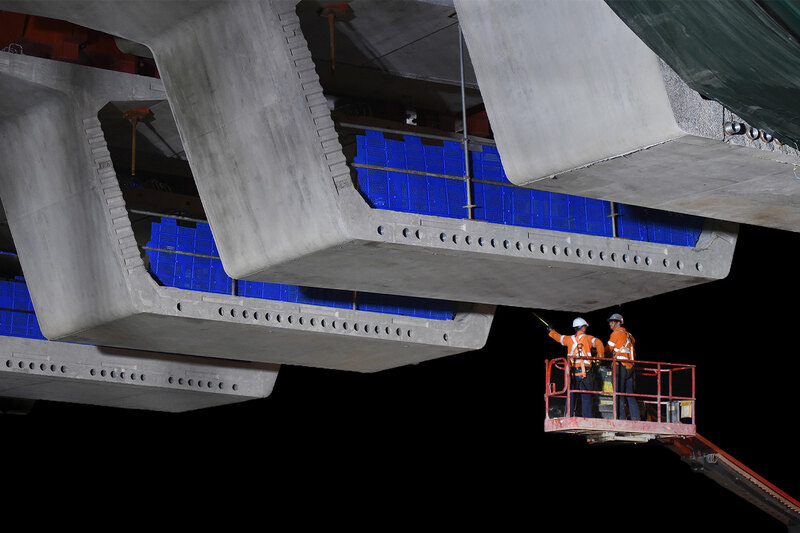 The Sydney Metro Northwest Skytrain is a significant project for many reasons, not the least that the deck superstructure was first built as a seven-span continuous girder on temporary supports using an overhead self-launching gantry. Thereafter the bridge was converted into a three-span cable stayed bridge and the temporary supports were removed. The use of the precast segmental concrete for the deck superstructure was a required continuation of the main viaduct. 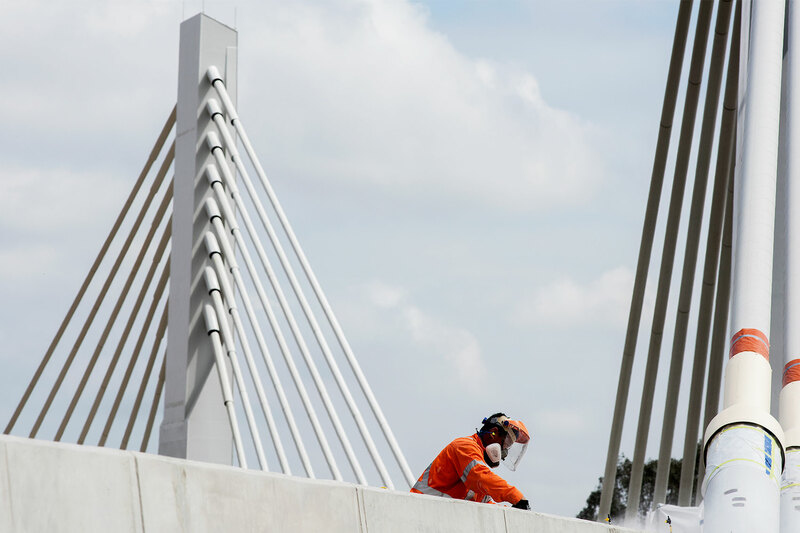 The challenge for the SMEC team became the integration of the techniques and temporary works used to build precast segmental concrete bridges with the demands of cable stayed bridge construction. There were many iterations to find a construction sequence that worked and, in the end, finding a practical solution was very rewarding. 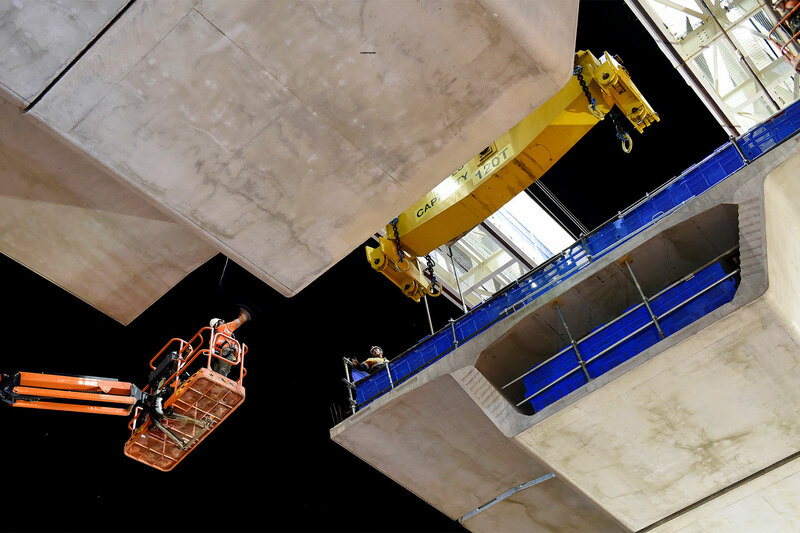 We learnt a lot technically and this project has undoubtedly proven that longer suspended precast segmental bridges can be erected using conventional erection methods. This innovative method of construction also had major safety benefits in that it eliminated the need for any day time closures of traffic lanes across Windsor Road. SMEC’s design team also learnt a lot about the latest construction technologies. Design and build projects such as the Sydney Metro Northwest Skytrain are a tremendous opportunity for design engineers to be actively involved in the construction process. The practical knowledge they gained was, is and will continue to be invaluable throughout their careers. The Sydney Metro Northwest Cable-Stayed Bridge was also awarded the Engineering Excellence Award by Engineers Australia, Best International Project Award by the South African Institution of Civil Engineering (SAICE) Durban, and Best International Project Award at the CESA Aon Engineering Excellence Awards in South Africa. Functional General Manager, Structures, SMEC South Africa. John leads the national Structures team in South Africa with over 60 staff. 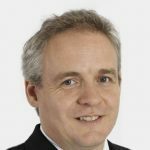 His team specialises in the design of bridge permanent and temporary works, including cable stayed bridges, rail structures, highway bridges and footbridges.